Saturday December 21st 1889 It was a gloomy morning and rainy afternoon and evening The rest of the boys went away this morning. We done the washing before noon. Em Weldie and Roy came about noon and stayed all night. I sewed in the afternoon I put $75.00 in the bank of boarders money today. Sunday December 22nd 1889 It had cleared of pleasant this morning and Emma went home. Mother went to church and spent the day at Hatties. Will and I had such a nice day here to ourselves. I read some and read in the evening. 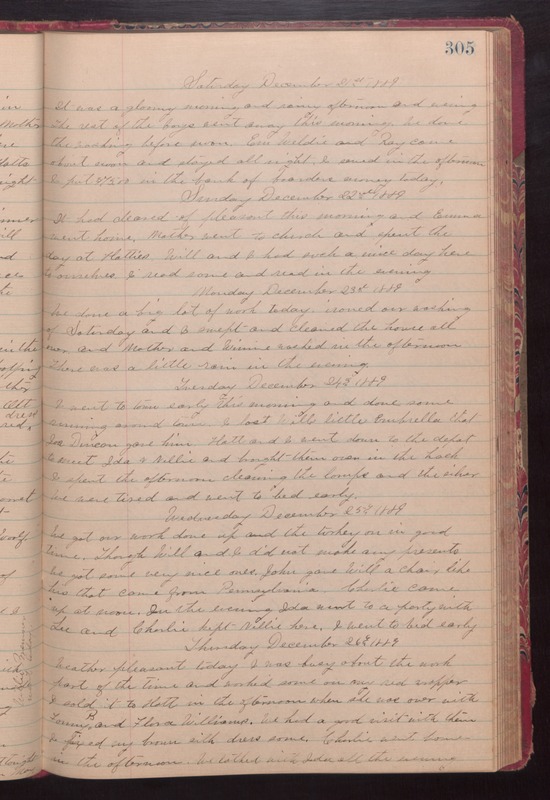 Monday December 23rd 1889 We done a big lot of work today, ironed our washing of Saturday and I swept and cleaned the house all over and Mother and Winnie washed in the afternoon. There was a little rain in the evening. Tuesday December 24th 1889 I went to town early this morning and done some running around town. I lost Wills little unbrella that Joe Duncan gave him. Hatt and I went down to the depot to meet Ida & Nellie and brought them over in the hack. I spent the afternoon cleaning the lamps and the silver We were tired and went to bed early. Wednesday December 25th 1889 We got our work done up and the turkey on in good time. Though Will and I did not make any presents we got some very nice ones. John gave Will a chair like his that came from Pennsylvania. Charlie came up at noon. In the evening Ida went to a party with Lee and Charlie kept Nellie here. I went to bed early. Thursday December 26th 1889 weather pleasant today. I was busy about the work part of the time and worked some on my red wrapper. I sold it to Hatt in the afternoon when she was over with Fanny and Flora Williams. We had a good visit with them. I fixed my brown silk dress some. Charlie went home in the afternoon. We talked with Ida all the evening.